Jeb Bush walks with members of the media and supporters as he departs a campaign event held in a barn belonging to former .S. Sen. Scott Brown, R-Mass., Tuesday, Nov. 3, in Rye, N.H.
"A president can't say 'You're fired,' and go to commercial break," Bush told more than 100 people at a senior center in Raymond, New Hampshire, Tuesday night. "A president has to roll up their damn sleeves and get to work." A night earlier, his voice showed signs of strain as he railed against what he called anemic economic growth. "That means more people stuck in poverty. That means one in five children on food stamps," Bush said, raising his voice during an event Tuesday in Rye, N.H. "That's the new normal. I hope you agree with this: we need to reject that out of hand. And we can do it." The volume and feeling reflect the urgency of Bush's drive to push his campaign into a winning position ahead of the first votes of the GOP nomination fight in Feb. Once seen as the probable favorite, Bush's viability has never really thrived in the face of unexpectedly strong support from outsiders Trump and retired neurosurgeon Ben Carson, who are leading the pack. Also a thorn for Bush: Marco Rubio, his onetime protege, who has approached the dynamics as an opportunity to win over the GOP establishment turned off by Trump and Carson. 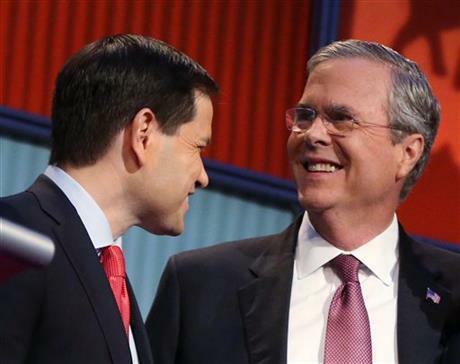 Bush took a more restrained tone on Rubio, with whom he'd clashed in last week's debate. 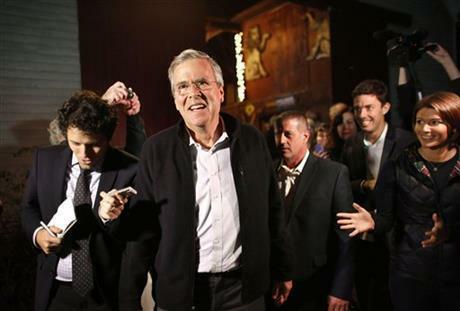 "He hasn't changed the culture in Washington," Bush told reporters aboard his campaign bus. 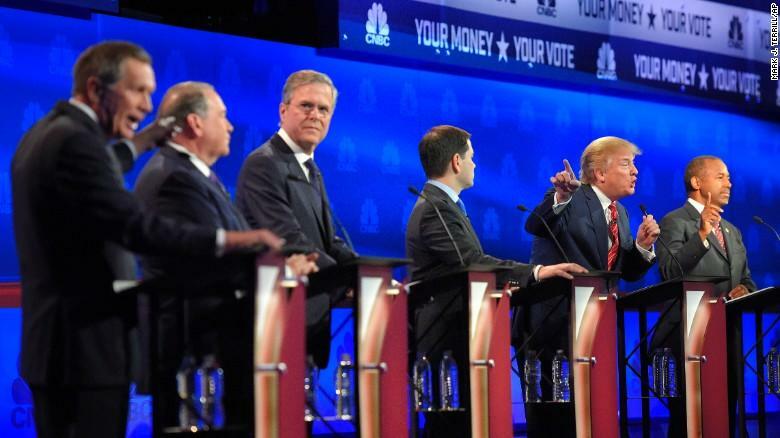 He refused to answer questions on Rubio's personal spending habits, which had had come up during last week's debate. "It's not my job to worry about that," Bush said. Priority No. 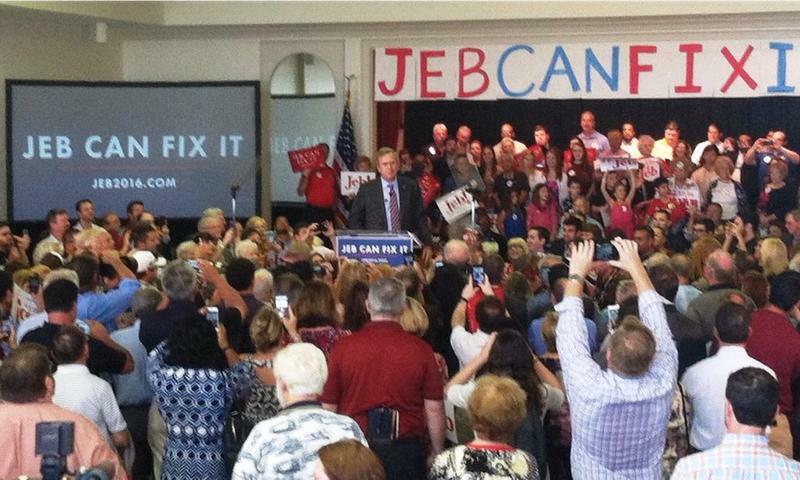 1 for Bush, acknowledged even by him, is injecting some life into his campaign. That has meant a new motto — "Jeb Can Fix It —a heavier travel schedule to early voting states and more attention-grabbing performances. After New Hampshire this week, he'll tour South Carolina. Traveling in a blue tour bus with the slogan plastered on its side, Bush stopped Wednesday at a Manchester area school in the morning, the pharmacy in Hollis later and was headlining a law enforcement and drug abuse roundtable in Goffstown in the early afternoon. He was headed north to the lake country for two events later in the day. Bush plans to wrap up the three-day visit Thursday. During a Republican debate in Colorado last week, Bush criticized Rubio for missing Senate action as he campaigns for president. Bush joked that the Senate's schedule was hardly demanding by suggesting it was akin to "a French workweek." Traveling with reporters in New Hampshire on Tuesday, Bush joked that comparing the French to Congress was really unfair to the French. "I really did a disservice to the French," he said, according to multiple press reports.